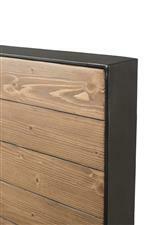 This Queen Panel Bed brings modern, rustic and industrial styles together perfectly. The modern aspect comes from it's straight, clean lines, the rustic from the natural wood texture and the industrial from the steel framing and base. It's safe to say that you'll love beginning and ending every day in this bed. The Edgefield Queen Panel Bed with Steel Framing and Accents by Cresent Fine Furniture at AHFA in the area. Product availability may vary. Contact us for the most current availability on this product. 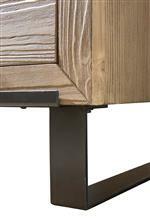 504-131QR Queen Panel Rail/Slats 1 0" 0" 0"
504-131QF Queen Panel FB 1 0" 0" 0"
504-131QH Queen Panel HB 1 0" 0" 0"
The Edgefield collection is a great option if you are looking for Rustic Contemporary furniture in the area.